CLEMATIS® is a smart complete RGBW LED lighting system. 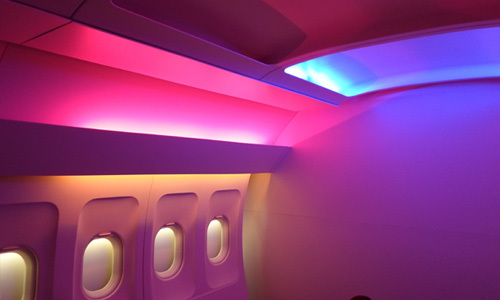 From the light sources to the lighting management network, we propose you to create billion of colors in your cabin. Take your smartphone or your tablet, open SELA link and relax… The principal network controls a dimmer sequencer box (storing color settings and scenarios) for several lights. We can extend the system simply by adding dimmer sequencer boxes, with no modifications to the principal control network system. In terms of colors rendering, the white light reproduces 90 % of sunlight. In addition, it offers full homogeneity and stabilized colors for the complete visible spectrum. The dimmer sequencer can work in standalone mode, linked to push buttons so passengers can trigger scenarios or adjust the color and brightness of individual lights. It can also be synchronized with other dimmer boxes, receiving scenario instructions from the network master box, the Master Light. The Master Light also enables interface with other cabin equipment, as it is equipped with a WiFi hub, Bluetooth, internet network, audio and video inputs. Our concept is to simplify the interface with the Cabin Management System (CMS). The CMS sends basic instructions to the Master Light, which manages the lights. This allows easy adaptation for any type of CMS. Our lighting Designer customizes the lighting according to the client’s requirements, managing the fine tuning, Ethernet and Wi-Fi connection to the Master Light box and the programming. He can also participate in the development and modification.